I’m just getting started making small boxes and practicing with Oak from old pallets. Got my wood all milled down just shy of final dimension and I’ve been letting it sit and now I’m getting some bowing and twisting. Seems like the more you mill down your wood the more you release it and get the deformities. 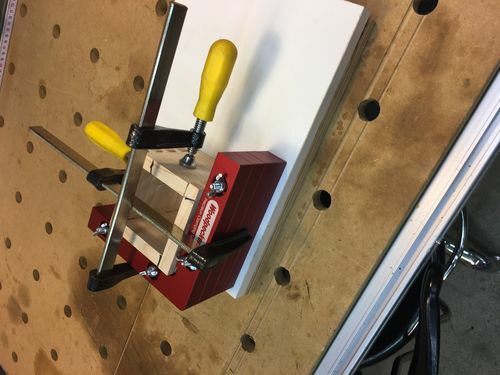 I’m using my Incra Ibox jig and have done a number of plywood boxes with success and a couple of pine boxes successfully but this is the first time with Oak. I guess my choice is to mill it down some more and not let it sit or try to see how it comes out the way it’s milled now. Any suggestions? Nothing wrong with oak, I would question what part of the oak tree dit the lumber coming from. If I am in the pallet building business, I would be using the cheapest wood available. Probably a lot of undesired wood that nobody wants. The lumber may be coming off from a tree limb where every time a cut is made, the board may move again. Who cares it is twisted? Just nail/screw together to hold it together. I am in the pallet business. Of course sometime you can get decent pieces from the pallet. The comment about the oak from the pallet is a good one. It might have internal stress. It might also be wet. I don’t do much with pallets, but the big sleepers that come under the bunks of plywood are the same stuff. There is always a big pile somewhere in the shop, and I always take the ones off the bottom when I want to make something. It sounds like I may have to try and straighten it again I’ve had the wood in a metal shed for a couple of years and it gets really hot in the summer and I let it sit in my garage for a few days and then started milling it down. Was all flat and in good shape when done. Then it sat this week and a few pieces bowed and twisted a bit. I didn’t get to the final dimension for length so I can cut these in half and still end up with a decent size small box. I would think that may help a bit to get them to all fit. If you’re making small boxes cut your pieces rough oversize then put in a toaster oven for 24 hours at around 200 degrees. This will get out all the moisture and you’re ready to go. Will that straighten them or will it get them to the point there is no moisture and then when they’re dimensioned they are stable? I thought a couple of summers in the metal shed at 135 degrees would have “cooked” them enough. Don’t wait so long after the final milling, use it within a day. How are you storing after milling? Is it stickered in a dry place with ventilation to all sides? Maybe Eric has hit on it then. They might be pulling back in moisture and warping. I know it is usually hot and dry in Eastern Washington in the summer, but this has been an unusually wet spring in the pacific northwest, maybe that is having an effect. Uh, pallet wood? Wet, poorly milled, chemicals, used for a finished project? NOT!!!!! Just my thoughts. I don’t touch that stuff. No, not stickered but stored on edge before it was milled and after milling on edge. Just practicing some more with wood and not plywood. Did a few boxes of pine and they came out fine. i used to work in a pallet mill some time ago. most of the time the logs that were put on the mainsaw in the morning were pallets by end of shift. in other words, palletwood can have a high MC. check the MC of your wood. Well I decided to see if my Incra IBox jig could handle the twist In the wood and I was pleasantly surprised that all the boxes came out pretty good. They are all square and all joints are tight and flush. I have them clamped in my little Woodpecker box clamping jig and that has really worked well. This isn’t one of the boxes but what I use to clamp the boxes square.